Hockey Helps the Homeless…but what does Canada do? 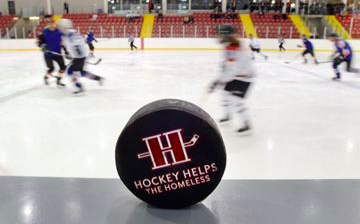 Hockey Helps the Homeless (HHTH) was started in 1996 as as industry tournament by Toronto businessman, Gary Scullion. Today, there are 14 tournaments held across Canada, and six university tournaments run by over 500 volunteers. Players are asked to raise a minimum of $250 in addition to paying the $200 registration fee which pays for 3 games, a personalized jersey, some food and a banquet. Last year, the Vancouver tournament raised over $346,000 in gross revenues and has raised over $1 million since 2011. HHTH partners with 35 different agencies across Canada to support front-line support projects (e.g., the disbursement of survival kits, food delivery trucks, providing medical and counselling services, and renovations) and reintegration and transition projects (e.g., helping to prepare people to reintegrate into the workforce and independent living by providing life skills, funding libraries and skills training). How does playing hockey help the homeless, aside from raising money? If HHTH tournaments are so successful at raising funds, why are the number of tournaments growing each year? 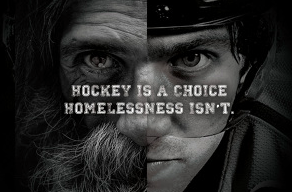 Is there any way that hockey actually contributes to homelessness? Is homelessness an individual concern or an issue for the government? Are money and resources all that is needed? If you told a homeless person on the street that you were going to play hockey on their behalf, what do you think their response would be? What role does the rising cost of living play in homelessness in Canada? At least, 200,000 Canadians experience homelessness in any given year. At least 50,000 Canadians are part of the “hidden homeless” on any given night – staying with friends or relatives on a temporary basis as they have nowhere else to go. Single adult males between the ages of 25-55 account for almost half the homeless population. Aboriginal people are over-represented among the homeless in every urban centre in Canada. Why is hockey doing double-duty as both a national pastime and social welfare fundraiser? It might have something to do with the “46-per-cent decrease in federal investment in affordable housing over the last 25 years“. In other words, the government has passed the buck onto Canadian citizens, relying on their goodwill rather than taking care of its people. According to the Chumir Foundation for Ethics in Leadership, homelessness grew 740% in Calgary between 1994 and 2006, and in Vancouver the number of homeless seniors tripled between 2002 and 2005. So, yes, go play hockey and raise money for local organizations that greatly need financial support (heck, I would do it for the custom jersey alone), but when the voting ballot comes around, ask your representative, whoever that may be, what they plan to do about affordable housing. Ask them why you are doing their work. Homelessness costs the Canadian economy $7 billion each year, which means that whatever HHTH raises is a drop in the bucket and represents an issue that extends far beyond the capabilities of charitable fundraising. What started as one tournament has grown into an annual nationwide fundraiser. Each additional tournament unfortunately highlights the magnitude of our compassion rather than the prevalence of the issue. It also promotes the idea that money is all that is needed, instead of a change in infrastructure (and maybe priorities). Tangible goods such as beds, cars, and clothing represent the surface of an issue that requires a re-structuring of employment opportunities and standards, student debt, and discrimination against marginalized groups such as Aboriginal and LGBTQ people. But realistically, how is one person supposed to end the discrimination of Aboriginal people that has taken place since Canada’s birth as a nation? It is an overwhelming task – so we raise money and play hockey, because many times that is all that we feel we can contribute. Sometimes I find sport an ironic vehicle for promoting social issues. Sport is based on a system that requires winners and losers, and so too do our systems of free-market growth and meritocracy. Only one team can win the Stanley Cup each year, which means that there are 29 losers every year. The system produces exponentially more losers than winners but we all like to think that this will be “our year”. This is also sadly how we talk about the lottery and career prospects in a era of decreasing job security. Moreover, as every hockey player and fan understands, there are a limited number of spots on a roster and those spots do not always go to the most deserving (Alexandre Daigle), the hardest workers (Alexander Semin), or the most talented (John Scott). So maybe if we consider a scoring slump equivalent to being laid off, being traded the same as the burden of (student) debt, and an injury like a diagnosis of disease, it becomes easier to see that we can only play the cards that we are dealt, and that merit plays a much smaller role than we might like to believe. Let us remember that as much fun as these types of fundraisers can be, their existence and proliferation ask more of us as individual citizens. And, rather than expanding to further reaches of the country the goal of charities should be to put themselves out of business. So how is HHTH helping to ensure that its services will no longer be needed in the future? This is such a great way to help the homeless. I wonder if the tournament can come to Edmonton? The new Ice District would be a perfect venue for this charity game. Daryl Katz build an amazing arena and the surrounding area has really changed the face of the downtown area. He is by far one of the most successful businessmen in North America. I am looking forward to seeing how he helps to take this team to the next level and what is next venture will be. He is really focusing on helping Edmonton become a fantastic tourist destination. I think that this charity tournament would be great for the city.